Caught this one on my first night in Mammoth Lakes (Calif.) earlier this month. 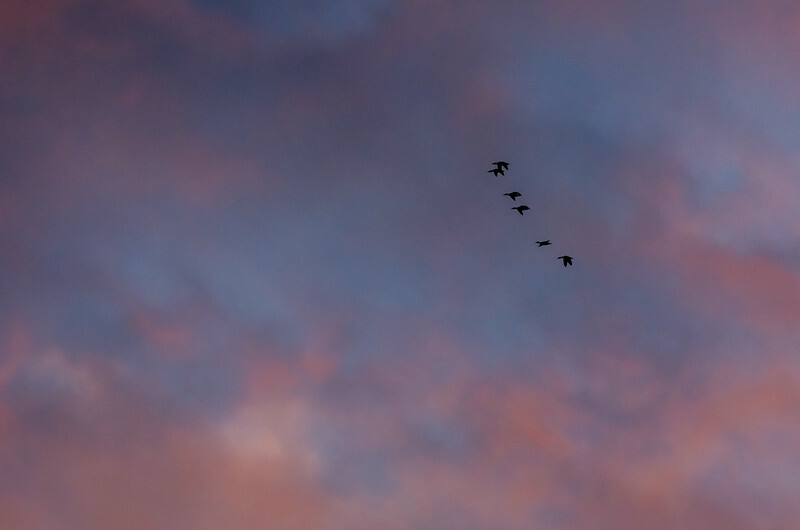 Geese were circling, the sunset took a turn for the better and I fired off a bunch of shots using my 70-300mm telephoto, hoping to catch the birds in an interesting formation. I was tempted to crop it but I like it as is. Big sky. Little birds. Imperfect formation thanks to those bottom two not matching like the top two pairs. Camera & Settings: Nikon D5100, ISO 400, f/5.6, 1/640th shutter, shot in RAW and processed in Lightroom 4. One note here: if you're buying a Nikon DX format camera and want to shoot wildlife, it may be worth investing in the 70-300mm telephoto instead of the 55-200mm kit lens or the 55-300mm lens that some people buy as an alternative. The 70-300 works well on both FX or DX cameras and on DX acts like a 105mm to 450mm lens. They run about $586 new (at Amazon) at this time, but I bought mine earlier this year used from B&H for $470. If you're interested in a print, they're for sale on my SmugMug site. They're affordable (prices start at $10) and available in 8 x 12, 12 x 18 and 16 x 24. Details here. I like the metallic prints, which really add some pop to the colors.